Chandbali jewellery is easy on eyes and classy to style. Chand means moon and bali means earrings, therefore chandbali resembles a dangling crescent moon. ZeroKaata, your best online jewellery store presents an exquisite collection of jaw-dropping collection of handmade chandbali jewellery. From traditional chandbali necklaces to unique and designer chandbali earrings, we have it all. Shop now and add an elegant desi touch to your ethnic attire. Sign up with us to get 15% off on your first order. Embellished with crescent-shaped designs, our handmade collection of chandbali inspired necklaces is not only exquisite but also budget friendly. We have a wide range of designer chandbali necklaces handcrafted in vibrant hues. 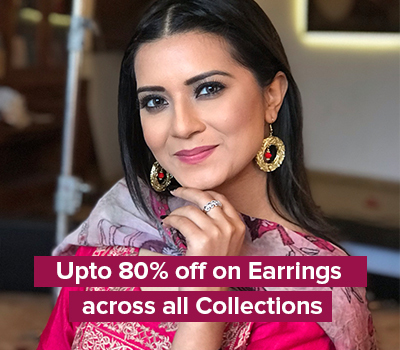 Shop Chandbali earrings online from our exquisite collection of handmade chandbali jewellery and don an adorable ethnic look. Available in a plethora of combinations of vibrant and pastel hues, our entire collection of chandbali earrings have been handcrafted with love and finesse. Our beautiful chandbali earrings are perfect to be paired with anything from a saree to a lehenga or an anarkali to an ethnic gown.